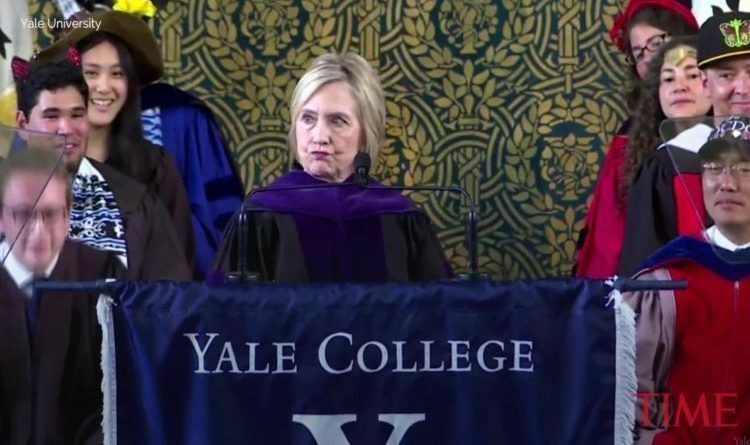 On Sunday, former Democratic presidential nominee Hillary Clinton told graduating students at Yale University she was still grappling with the results of the 2016 election, as she pulled out a traditional Russian ushanka hat, and held it aloft. She started her speech talking about the Yale tradition for graduates to wear over-the-top hats on Class Day, pulling out her own hat and saying, “I brought a hat too. A Russian hat. I mean, if you can’t beat ’em, join ’em,” to laughter from the crowd. She also added that she did not get over 2016 election. “This is a moment to reach across divides of race, class, and politics to try to see the world through the eyes of people very different from ourselves and to return to rational debate,” she continued, speaking of “radical empathy” in the face of heightened partisanship and otherness. The former first lady also threw in a call for “common-sense gun safety legislation as soon as we can get it” during a brief discussion of Friday’s mass shooting at Santa Fe High School in Texas. I personally think the Russian hat is an insult to America. Saying she got away with bribes and collusion with the Russians. So, she is joining the Russians now. I think she basically already did; when she gave away our Uranium to them. But, she has a lot of nerve complaining about election interference when she and Debbie rigged the nomination process and then she comes up with a fake Russian dossier on president Trump. How she is not in jail is beyond me. ← Did LeBron James Purposefully Bypass A Fan Who Was Wearing MAGA Hat?